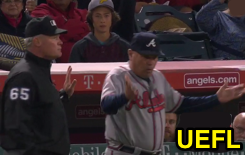 1B Umpire Ted Barrett ejected Braves Manager Brian Snitker (balk call) in the bottom of the 5th inning of the Braves-Angels game. With two out and one on (R1), Braves pitcher Jaime Garcia was called for a balk while attempting to pick off Angels baserunner R1 Shane Robinson. Replays indicate Garcia failed to step directly toward first base before throwing to the base; he stepped toward home plate, the call was correct. * Play was reviewed and affirmed by the UEFL Appeals Board (8-0-1), the call was correct. At the time of the ejection, the Braves were leading, 1-0. The Angels ultimately won the contest, 2-1. This is Ted Barrett (65)'s first ejection of the 2017 MLB regular season. Ted Barrett now has 5 points in the UEFL Standings (1 Previous + 2 MLB + 2 Correct Call = 5). This is the 56th ejection report of 2017. This is the 30th Manager ejection of 2017. This is Atlanta's 1st ejection of 2017, T-3rd in the NL East (MIA 5; WAS 2; ATL, NYM, PHI 1). This is Brian Snitker's first ejection since September 23, 2016 (Adam Hamari; QOC = Y [Balls/Strikes]). This is Ted Barrett's first ejection since June 24, 2016 (John Gibbons; QOC = Y-C [Foul/HBP]). Wrap: Atlanta Braves vs. Los Angeles Angels of Anaheim, 5/31/17 | Video via "Read More"